There is a fashion for producing eye-catching infographics of trial results. This is a good thing in some ways, because it’s important to get the results communicated to doctors and patients in a way they can understand. 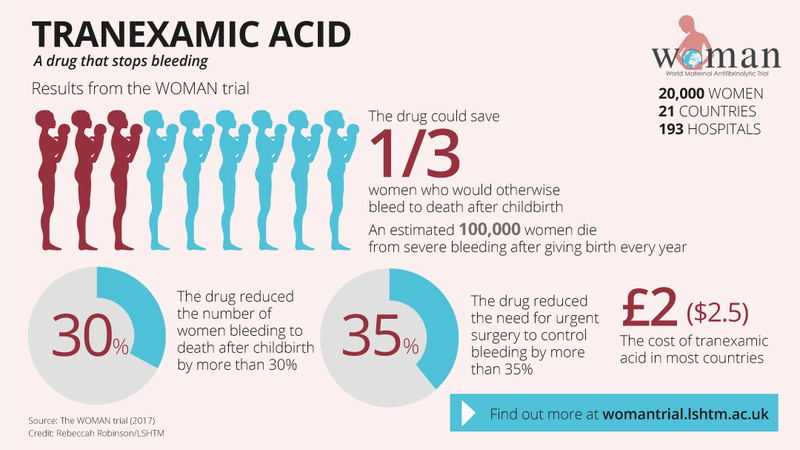 Here’s one from the recent WOMAN trial (evaluating tranexamic acid for postpartum haemorrhage). What’s wrong with this? To my mind the main problem is that if you reduce the messages to a few headlines then you end up leaving out a lot of pretty important information. One obvious thing missing from these results is uncertainty. We don’t know, based on the trial’s results, that the number of women bleeding to death would be reduced by 30% – that’s just the point estimate, and there’s substantial uncertainty about this. Actually the reduction by 30% isn’t the trial’s main result, which has the risk ratio for death due to haemorrhage as 0·81, 95% CI 0·65–1·00. So that’s actually a point estimate reduction of 19%, with a range of effects “consistent with the data” (or not significantly different from the data) of a reduction between 35% and zero. The 30% reduction seems to come from a subgroup analysis of women treated within 3 hours of delivery. A bit naughty to use a subgroup analysis as your headline result, but this highlights another problem with the infographic – you don’t really know what you’re looking at. In this case they have chosen to present a result that the investigators presumably feel represents the real treatment effect – but others might have different views, and there isn’t any way of knowing that you’re seeing results that have been selected to support a particular story. PS And what’s with the claim at the top that the drug could save 1/3 of the women who would otherwise die from bleeding after childbirth? That’s not the same as 30%, which wasn’t the trial’s result anyway. I guess a reduction of 1/3 is a possible result but so are reductions of 25% or 10%.